NES Toy Story (China) in 03:51.2 by FilipeTales. 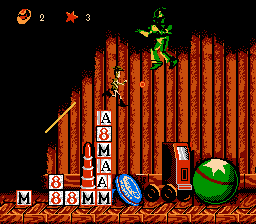 Toy Story is a pirated port of the SNES/Mega Drive/Game Boy/Windows 95 game of the same name for the Famicom. It was made in 1997 by Ei-How Yang and is notable for its many typos. This run uses a hacked ROM that lets the game run on emulators and also fixes grammar errors.